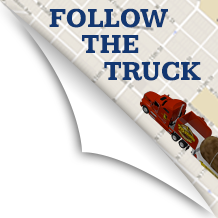 We estimate this tour will take us to 60 cities and over 23,000 miles in the five-months that we are on the road. 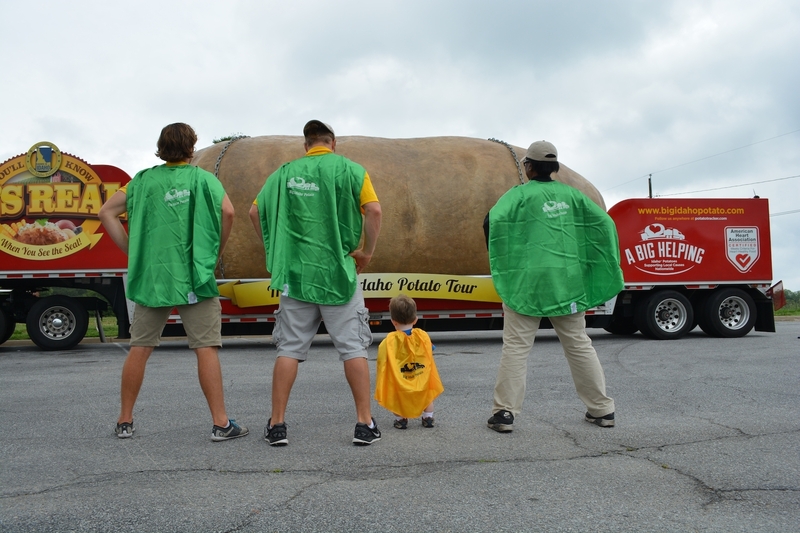 We’ll attend events, festivals, and fundraisers, and meet tens of thousands of people along the way. 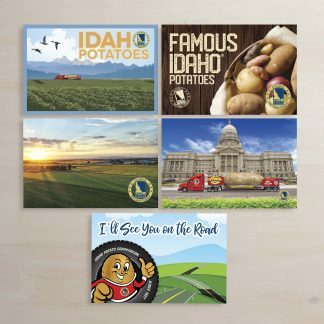 When it is all said and done and we come rolling back into Boise, road-worn and road-wise, we’ll be bombarded with questions from friends and family members who want to hear our craziest and favorite stories from these far away places. Often times this can lead to long hesitation as we try to trace our way back through the myriad of new friends, incredible places and unforgettable moments, analyzing and comparing them in real time as we try to think of the perfect stories to relay… but not this year. This year our answer will come fast and our pause, if any, will be solely to allow us the opportunity to catch our breath before we begin the difficult task of conveying the many emotions we felt when we met a real life superhero: Jacob Walker. The best part about our story is that it takes place far away from all of the expected candidates: the Kentucky Derby, Bristol Speedway, the National Memorial Day Parade, SeaFaire, etc. Our story is much more humble than that and its location boasts a population of a mere 2,400 people. No one will expect us to take them to Crewe, Virginia, and talk about one of the smallest boys in the world. But that’s exactly what we’ll do. 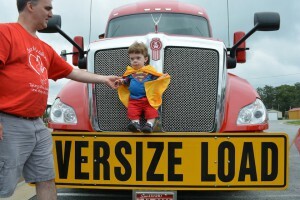 Jacob Walker is a 2.5-foot tall five-year-old who has a rare form of dwarfism. It is so rare, in fact, that he is one of less than five living kids in the world that has his variation of it. But physical stature aside, Jacob stands tall with the support of his community, his 20,000+ Facebook fans, and, most importantly, his amazing family. 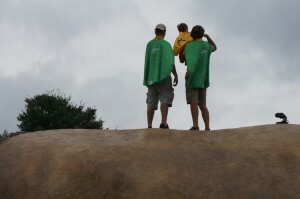 It is hard to surprise superheroes. Their heightened senses and increased intellectual capacity really makes it difficult to get anything by them. So needless to say, Jacob knew we were coming. When they pulled into the parking lot at the Crewe Station, he didn’t need an invitation… he knew exactly what to do. 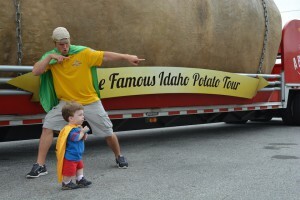 He beelined it straight for the Big Idaho Potato (AKA the ‘Spudmobile’) and got to work. After getting him properly fitted with his one-of-a-kind yellow cape, he began to familiarize himself with the truck. He went up, in and under the tractor, pulled the horn and dubbed my upper bunk superior to Adam’s lower bunk (but we knew that already). 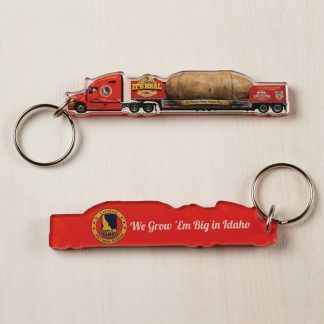 After that it was Idaho Potato time. 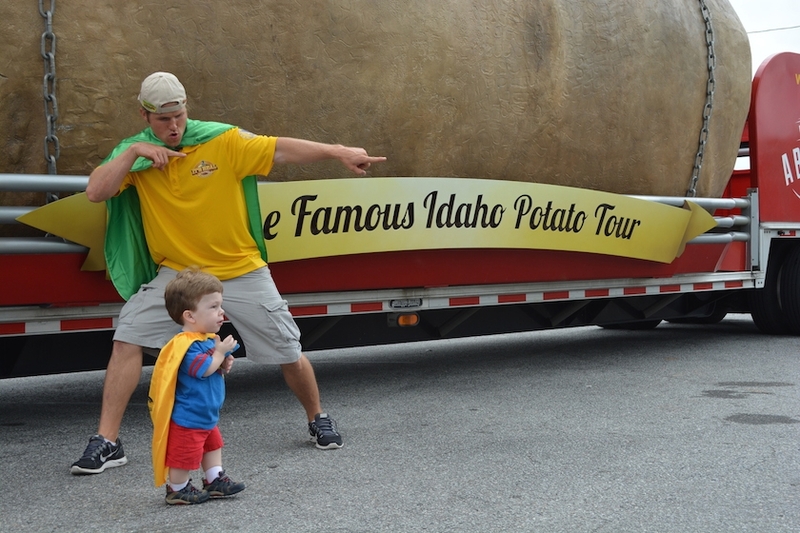 We took him into the Spud Cave and then flew around on top of the potato. From there we had a great vantage point of the surrounding terrain and our approaching enemies. We assessed the situation, consulted Jacob and then prepared to defend the city of Crewe. 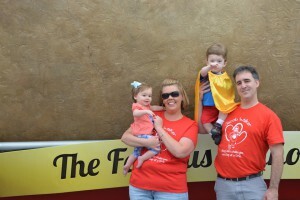 We learned that kids with Jacob’s uniqueness are often plagued with an inability to walk, respiratory illnesses and that they only live until they are about four or five years old. This is proof that our Jacob is resilient beyond our comprehension. Not only does he walk, talk and boast a big-boy age of five, but he does it all with a smile and a lot of imagination. He stood unafraid next to the Tater Team, fighting crime; not batting an eyelash at loud horns, heights or, worst of all, that evil Lex Luther. As a Make-A-Wish kid, his ultimate goal is to get so good at crime fighting, that he can meet up with the likes of ‘the real’ Iron Man at Disneyland. 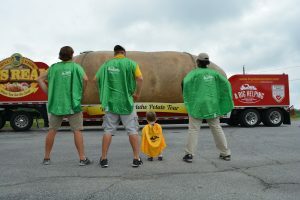 As he is now part of the potato family, we were honored to be able to contribute $500 directly to his wish so that day could come sooner rather than later. After a hearty meal of chicken nuggets and, of course, French fries, we stood there one last time together before heading out to our next destination. With hands on our hips and our capes blowing in the wind, we summarized the scene around us. Countless foes littered the ground while the town’s people looked on anxiously and graciously towards their fearless defender: Jacob. We stood there side-by-side, not with a 2.5-foot tall boy, but with a giant. My hope is that we can all find the same zeal and courage to take on life’s challenges in the same way as this brave young superhero. Thank you Jacob for everything you taught us. 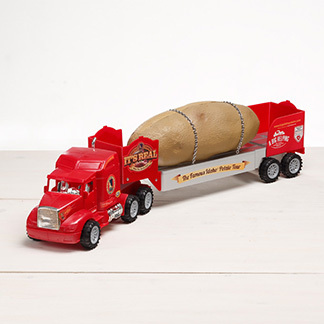 Good luck and keep fighting until the next time we can pass back through with your Spudmobile!